This article covers several tips, features and techniques a developer can use to build a modern macOS app in Xamarin.Mac. To achieve this looks in a Xamarin.Mac app, the developer will want to use a Full Size Content View, meaning the content extends under the Tool and Title Bar areas and will be automatically blurred by macOS. When using a Full Size Content View, the developer may need to offset the content beneath the title and tool bar areas so that specific content (such as labels) doesn't slide under them. To complicate this issue, the Title and Tool Bar areas can have a dynamic height based on the action that the user is currently performing, the version of macOS the user has installed and/or the Mac hardware that the app is running on. As a result, simply hard coding the offset when laying out the User Interface will not work. The developer will need to take a dynamic approach. Apple has included the Key-Value Observable ContentLayoutRect property of the NSWindow class to get the current Content Area in code. The developer can use this value to manually position the required elements when the Content Area changes. The better solution is to use Auto Layout and Size Classes to position the UI elements in either code or Interface Builder. // Has the constraint already been set? By overriding the View Controller's UpdateViewConstraints method, the developer can test to see if the needed constraint has already been built and create it if needed. This effect is typically used for Shoebox Applications (one window apps) like Maps, Calendar, Notes and System Preferences. The Accessory View controller will automatically be blurred and resized by the system without developer intervention. 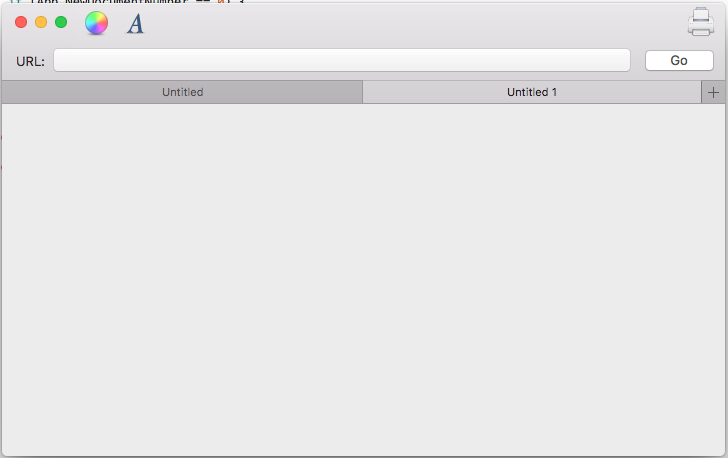 In the Solution Explorer, double-click the Main.storyboard file to open it for editing. Return to Visual Studio for Mac to sync the changes. Because macOS is now fully localized, the Left and Right NSLayoutAttribute properties have been deprecated and should be replaced with Leading and Trailing. Windows will automatically be Tabbed when the OrderFront method is invoked. Windows will automatically be Untabbed when the OrderOut method is invoked. In code all Tabbed windows are still considered "visible", however any non-frontmost Tabs are hidden by the system using CoreGraphics. Use the TabbingIdentifier property of NSWindow to group Windows together into Tabs. If it is an NSDocument based app, several of these features will be enabled automatically (such as the plus button being added to the Tab Bar) without any developer action. Non-NSDocument based apps can enable the "plus" button in the Tab Group to add a new document by overriding the GetNewWindowForTab method of the NSWindowsController. Where the NewDocumentNumber property keeps track of the number of new documents created and the NewDocument method creates a new document and displays it. /// A helper shortcut to the app delegate. // Is this the first document? Where the static App property provides a shortcut to get to the AppDelegate. The SetDefaultDocumentTitle method sets a new documents title based on the number of new documents created. Core Animation is a high powered graphics rendering engine that is built into macOS. Core Animation has been optimized to take advantage of the GPU (Graphics Processing Unit) available in modern macOS hardware as opposed to running the graphics operations on the CPU, which can slow down the machine. The CALayer, provided by Core Animation, can be used for tasks such as fast and fluid scrolling and animations. An app's User Interface should be composed of multiple subviews and layers to fully take advantage of Core Animation. Content - Can be a NSImage or CGImage that provides the contents of the layer. BorderWidth - Sets the border width. BorderColor - Sets the border color. To utilize Core Graphics in the app's UI, it must be using Layer Backed Views, which Apple suggests that the developer should always enable in the Window's Content View. This way, all child views will automatically inherit Layer Backing as well. Additionally, Apple suggests using Layer Backed Views as opposed to adding a new CALayer as a sublayer because the system will automatically handle several of the required settings (such as those required by a Retina Display). If the developer doesn't set this property, the View will be redrawn whenever its frame origin changes, which is not desired for performance reasons. With this property set to OnSetNeedsDisplay the developer will manually have to set NeedsDisplay to true to force the content to redraw, however. When a View is marked as dirty, the system checks the WantsUpdateLayer property of the View. If it returns true then the UpdateLayer method is called, else the DrawRect method of the View is called to update the View's contents. Apple prefers using UpdateLater over DrawRect whenever possible as it provides a significant performance boost. Use the same layer.Contents for UI elements that look similar. Apple also prefers the developer to compose their UI using standard views such as NSTextField, again whenever possible. To present a modern Drag and Drop experience for the user, the developer should adopt Drag Flocking in their app's Drag and Drop operations. Drag Flocking is where each individual file or item being dragged initially appears as an individual element that flocks (group together under the cursor with a count of the number of items) as the user continues the drag operation. If the user terminates the Drag operation, the individual elements will Unflock and return to their original locations. The flocking effect was achieved by sending each item being dragged to the BeginDraggingSession method of the NSView as a separate element in an array. This allows the developer to provide an individual NSDraggingItem for every item in the table that is being dragged as opposed to the older method WriteRowsWith that write all of the rows as a single group to the pasteboard. When working with NSCollectionViews, again use the PasteboardWriterForItemAt method as opposed to the WriteItemsAt method when Dragging begins. 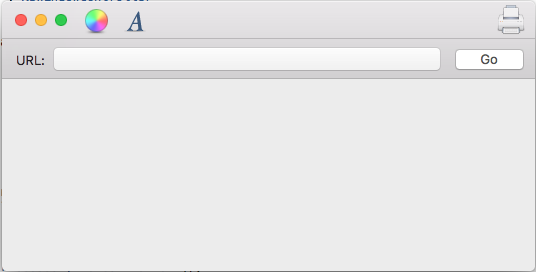 The developer should always avoid putting large files on the pasteboard. New to macOS Sierra, File Promises allow the developer to place references to given files on the pasteboard that will later be fulfilled when the user finishes the Drop operation using the new NSFilePromiseProvider and NSFilePromiseReceiver classes. 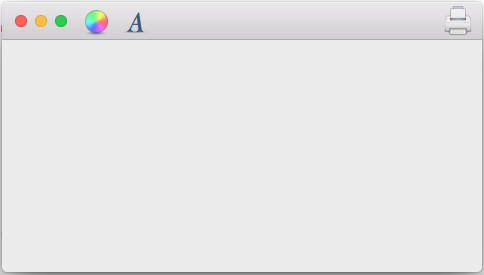 For a User Interface element (such as a NSButton) that has been added to a Title or Tool Bar area, the user should be able to click the element and have it fire an event as normal (such as displaying a popup window). However, since the item is also in the Title or Tool Bar area, the user should be able to click and drag the element to move the window as well. This code uses the TrackEventsMatching method of the NSWindow that the UI element is attached to intercept the LeftMouseUp and LeftMouseDragged events. For a LeftMouseUp event, the UI element responds as normal. For the LeftMouseDragged event, the event is passed to the NSWindow's PerformWindowDrag method to move the window on screen. 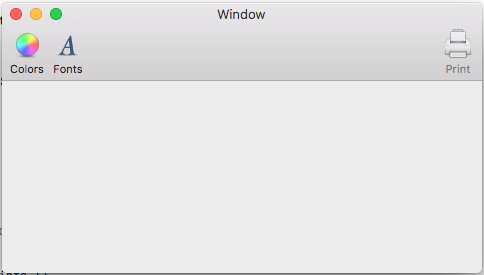 It allows for the Window to move, even if the app is hung (such as when processing a deep loop). Space switching will work as expected. The Spaces Bar will be displayed as normal. Window snapping and alignment work as normal. 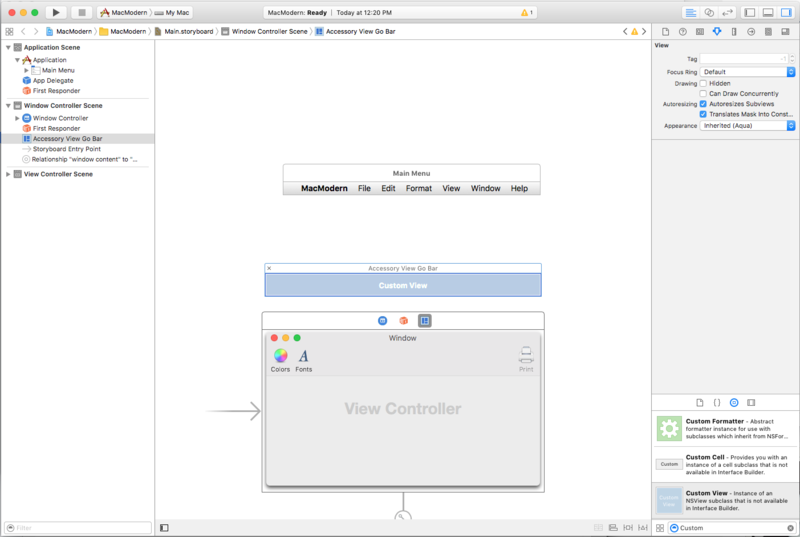 macOS Sierra provides many modern improvements to the existing Container View Controls available in previous version of the OS. Regular - Performs a standard non-destructive action such as edit the row's contents. Destructive - Performs a destructive action such as delete the row from the table. These actions will be rendered with a red background. 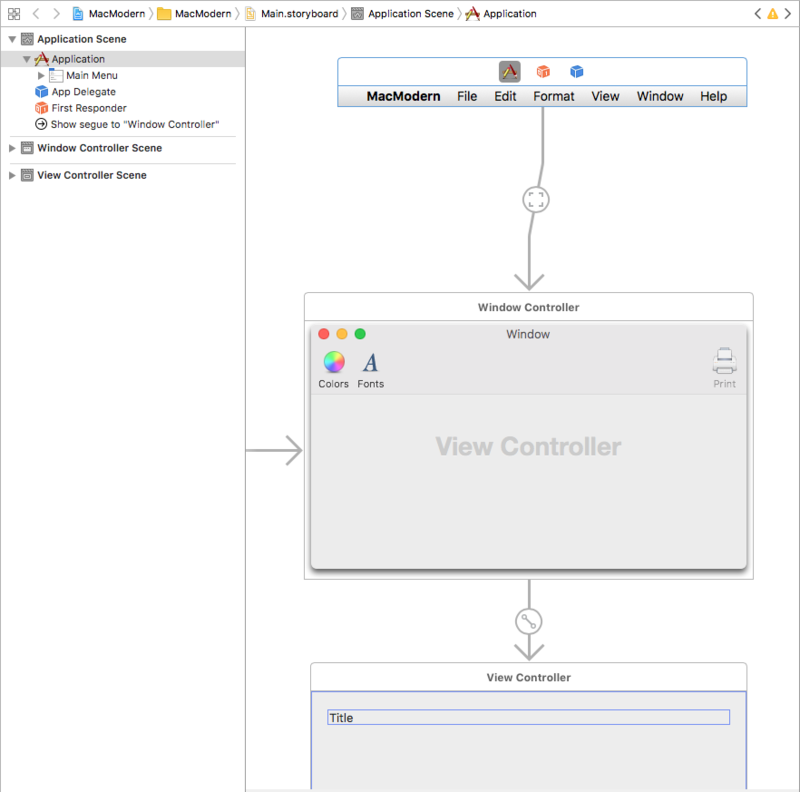 When using a Scroll View (NSScrollView) directly, or as part of another control (such as NSTableView), the contents of the Scroll View can slide under the Title and Tool Bar areas in a Xamarin.Mac app using a Modern Look and Views. 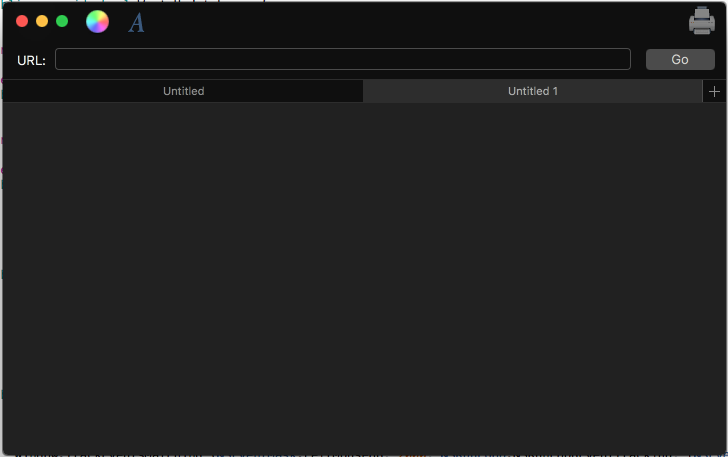 As a result, the first item in the Scroll View content area can be partially obscured by the Title and Tool Bar area. ContentInsets - Allows the developer to provide a NSEdgeInsets object defining the offset that will be applied to the top of the Scroll View. AutomaticallyAdjustsContentInsets - If true the Scroll View will automatically handle the ContentInsets for the developer. A Sort indicator like the one shown in the Mail app. A Refresh or Update button. Apple has included several technologies in Xcode that allow the developer to easily create an internationalized macOS app. 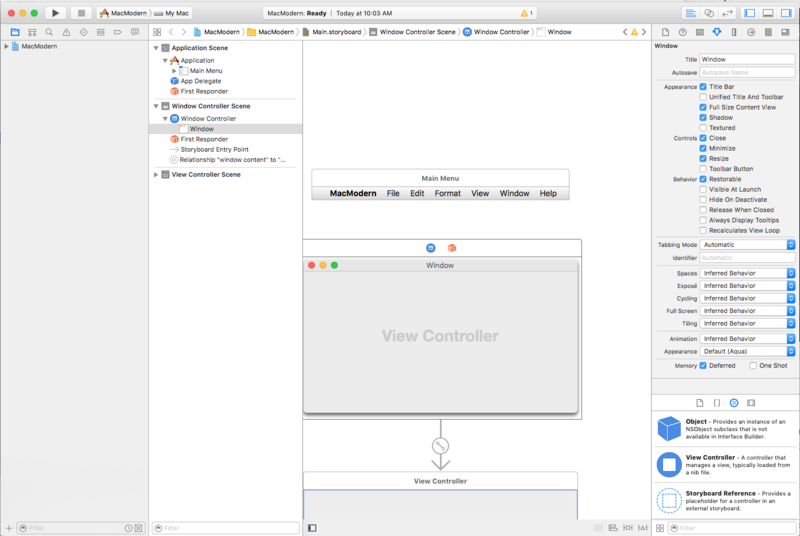 Xcode now allows the developer to separate user-facing text from the app's User Interface design in its Storyboard files and provides tools to maintain this separation if the UI changes. For more information, please see Apple's Internationalization and Localization Guide. By implementing Base Internationalization, the developer can provide a single Storyboard file to represent the app's UI and separate out all of the user-facing strings. When the developer is creating the initial Storyboard file (or files) that define the app's User Interface, they will be built in the Base Internationalization (the language that the developer speaks). Next, the developer can export localizations and the Base Internationalization strings (in the Storyboard UI design) that can be translated into multiple languages. Later, these localizations can be imported and Xcode will generate the language-specific string files for the Storyboard. Because localized versions of string values can have vastly different sizes and/or reading direction, the developer should use Auto Layout to position and size the app's User Interface in a Storyboard file. Remove Fixed Width Constraints - All text-based Views should be allowed to resize based on their content. Fixed width View may crop their content in specific languages. Use Intrinsic Content Sizes - By default text-based Views will auto-size to fit their content. For text-based View that are not sizing correctly, select them in Xcode's Interface Builder then choose Edit > Size To Fit Content. Apply Leading and Trailing Attributes - Because the direction of the text can change based on the user's language, use the new Leading and Trailing constraint attributes as opposed to the existing Right and Left attributes. Leading and Trailing will automatically adjust based on the languages direction. Pin Views to Adjacent Views - This allows the Views to reposition and resize as the Views around them change in response to the language selected. Don't Set a Windows Minimum and/or Maximum Sizes - Allow Windows to change size as the language selected resizes their content areas. Test Layout Changes Constantly - During development at app should be tested constantly in different languages. See Apple's Testing Your Internationalized app documentation for more details. Use NSStackViews to Pin Views Together - NSStackViews allows their contents to shift and grow in predictable ways and the content change size based on the language selected. Natural - The layout is based on the string assigned to the control. Left to Right - The layout is always forced to left to right. Right to Left - The layout is always forced to right to left. Left to Right - The layout is always left to right. Right to Left - The layout is always right to left. Typically these should not be changed unless a specific alignment is required. Automatically - The position will automatically change based on the direction of the language selected. In Right To Left Interface - The position will only be changed in right to left based languages. Never - The position will never change. If the developer has specified Center, Justify or Full alignment on the content of a text-based View, these will never be flipped based on language selected. Where the Alignment and ImagePosition are being set based on the UserInterfaceLayoutDirection of the control. The static GetAppearance method of the NSAppearance class is used to get a named appearance from the system (in this case NSAppearance.NameVibrantDark). Prefer named colors over hardcoded values (such as LabelColor and SelectedControlColor). Use system standard control style where possible. A macOS app that uses the System Appearances will automatically work correctly for users that have enabled Accessibility features from the System Preferences app. As a result, Apple suggests that the developer should always use System Appearances in their macOS apps. Storyboards allow the developer to not only design the individual elements that make up an app's User Interface, but to visualize and design the UI flow and the hierarchy of the given elements. For more information, please see our Introduction to Storyboards documentation. Data dependancies should always cascade downwards through the hierarchy. Avoid hardcoding UI structural dependancies, as this limits UI flexibility. Use C# Interfaces to provide generic data dependancies. For more information, please see our Segues documentation. Based on the design of the macOS app, there might be times when the best handler for an Action on a UI control might be in elsewhere in the UI Hierarchy. This is typically true of Menus and Menu Items that live in their own scene, separate from the rest of the app's UI. To handle this situation, the developer can create a Custom Action and pass the Action up the responder chain. For more information please see our Working with Custom Window Actions documentation. NSUserActivity - This allows the app to describe the activity that the user is currently involved in. NSUserActivity was initially created to support HandOff, where an activity started on one of the user's devices could be picked up and continued on another device. NSUserActivity works the same in macOS as it does in iOS so please see our Introduction to Handoff iOS documentation for more details. Siri on Mac - Siri uses the Current Activity (NSUserActivity) to provide context to the commands a user can issue. State Restoration - When the user quits an app on macOS and then later relaunches it, the app will automatically be returned to its previous state. The developer can use the State Restoration API to encode and restore transient UI states before the User Interface is displayed to the user. If the app is NSDocument based, State Restoration is handled automatically. To enable State Restoration for non-NSDocument based apps, set the Restorable of the NSWindow class to true. Documents in the Cloud - Prior to macOS Sierra, an app had to explicitly opt-in to working with documents in the user's iCloud Drive. In macOS Sierra the user's Desktop and Documents folders may be synced with their iCloud Drive automatically by the system. As a result, local copies of documents may be deleted to free up space on the user's machine. NSDocument based apps will automatically handle this change. All other app types will need to use a NSFileCoordinator to sync reading and writing of documents. This article has covered several tips, features and techniques a developer can use to build a modern macOS app in Xamarin.Mac.